CLAIRE ROSE CLITEUR <3 BURBERRY! Dutch girl Claire Rose Cliteur, who documents her travels and style through social media, is one of the biggest influencers of The Netherlands. She studied Fashion and Management at the Amsterdam Fashion Institute, graced the cover of Cosmopolitan Netherlands and gained 347,00 followers on Instagram. Get to know her in an exclusive interview with us and find out what’s her favourite Designer treasure at the moment! What is your favourite designer piece at the moment? My burberry skirt for sure, I love the pleats and the check print. It’s both feminine and cool at the same time, definitely a must-have for your wardrobe! 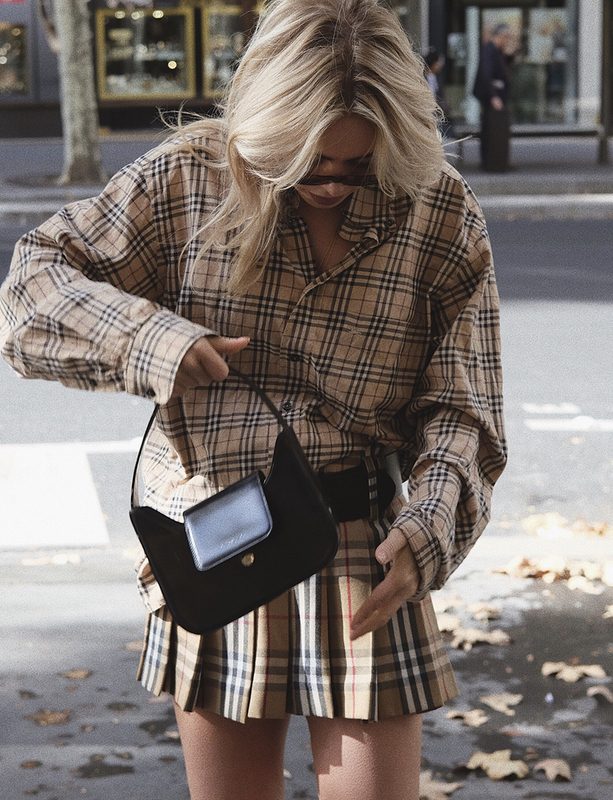 What do you love the most about the brand Burberry? I love how sophisticated and timeless the brand is. Plus they stay true to their values while they still keep reinventing the classic pieces. Burberry is the embodiment of british luxury. How do you define luxury? To me, luxury can be defined in various ways. Luxury is beautifully crafted timeless pieces. Luxury is also a feeling, a contentment that comes from living well and being happy. I see it as a luxury that I can live the life I’m living right now and that I’m surrounded by people who I love and care about. The Nova Check lining is really having a renaissance right now and is worn inside out. How do you style your checked skirt? I love styling it with a nice long knee boot or for a slightly rougher look you could wear the skirt with sturdy leather boots and a knitted sweater or a black turtleneck. Add some cool shades to complete the look and I’m good to go! Is buying vintage important for you? Yes absolutely, I love buying vintage items. Most vintage pieces are artfully crafted and made with a great eye for detail. Vintage pieces are very special to me because they are unique. As I love to take this life lesson into my style, I think it’s super important that you are unique and stay true to yourself. Besides that, buying vintage is very sustainable compared to fast fashion. I love to mix designer items with streetwear to create a fashionable yet cool look. You’re a style inspiration for so many women. Whose style are you inspired by? I’ve always loved Audrey Hepurn’s sophisticated style and have always been inspired by my mum as well. She is a real style icon to me! What brands are trending in your hometown Amsterdam right now? Amsterdam is a very casual city. People will usually choose comfortable over trendy pieces and I definitely see more and more streetwear worn as everyday clothes. What are your thoughts on Instagram and how it’s influencing fashion? I think Instagram is a great style inspiration platform available to everyone, I always take a look on Instagram to get some fashion inspiration. It also really made fashion more transparant and brands and influencers are now in direct contact with their followers. The world is a book and I plan to read all pages“ is your Instagram slogan. What will happen on the next page? If you knew what’s on the next page, would you read it…?